Ready for the bus ride to the mountain! bus ride, they marveled at the dark skies that seemed to bleed with fire as the sun crept up over the snow tipped mountains. They clenched their stomachs to contain their breakfast and calm the nervous butterflies. They talked and talked about what they expected, what they dreamed, and the crazy dares they would attempt. On the final leg of the journey, they glued their faces to the window, fixated by the fresh and natural snow glistening on the roadside. When they arrived, they inhaled the fresh, cold mountain air, and held their breath as they beheld the snow-powdered pine trees, intimidating jumps, and sparkling white snow covering the trails winding through the trees. 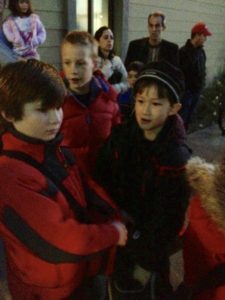 They quickly geared up and rushed out of the bus to meet their cheerful, new ski instructors and smiling group mates. As soon as they were rounded up, they proudly marched off to the white slopes. The group introduced themselves to each other, and then the instructor lectured them about the basic rules and risks of skiing. Rather impatiently, the children urged their instructor to just let them hit the steep slopes and dazzle him with their skills. The bemused instructor agreed that they could, IF they could first ski the bunny slope without falling down. Almost everyone in the group fell down immediately, and a talented few didn’t make farther than a few feet. The instructor described and demonstrated how to make the first basic moves. With the instruction and encouragement, and after a dozen tries, they were able to follow him down the bunny slope. At lunchtime, the group made their way to the hydration station and ate their fill of sandwiches and pizza. They were surprised at how hungry they were after hours of training. With mouths full of food, the groups made jokes and talked about what they could do, and what they thought they could do. Each tale more boisterous and impossible than the last. When they ran out of words, they got right back into skiing, practicing the basic moves. When the time came for them to return, they slowly trudged their way back to the buses, their bodies groaning with exhaustion. On the ride home, some napped and some just sat there thinking about their day. The two friends smiled as they recounted all of their exploits that day. They laughed about their follies and mistakes and congratulated each other on their accomplishments. When they arrived home, they tried to act cool and casual about their adventures on the mountains. Driven past exhaustion, they ate, showered, and slept, in that order. Sometimes skipping the first two steps. Over the next four Saturdays, they learned to ride through half of the trails that blazed down the mountain. And they continued to learn and improve for the next three years. The fourth year, they transitioned to snowboarding, widening their horizons even further. They were maturing physically and mentally, and their snow skills were increasing by leaps and bounds. That boy was me. 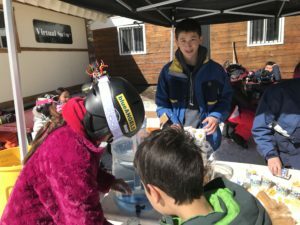 After a few years of snowboarding, I was now one of the older kids, and began helping the instructors with the younger kids. When I was old enough, I decided to become a junior chaperone for Blue Angels. I was proud and eager to give back to the program that had trained me for more than half of my life. I help to get the equipment ready for the kids in the morning, feed them snacks and lunch at the hydration station, and secure all of the equipment under the bus at the end of the day. The chaperone experience has been truly rewarding. I look upon the small faces filled with bewilderment as they behold snow for the first time in their life, mirroring the expression I had on my first day. When I have a little free time, I grab my board and tag along with one of the groups to help the younger kids. Every weekend, I make some new friends, and always learn something new. My chest fills with ambition, passion, and accomplishment when I think that I have spent nine years skiing and snowboarding with the Blue Angles program. chaperones, students, and especially to Heidi, who founded the whole program. Heidi, I thank you from the bottom of my heart for giving all of us kids the chance to experience the crisp snow under our feet as we fly down the mountain. It is a special treat for us California kids who otherwise wouldn’t get to experience snow. You have provided us the opportunity to feel the thrill of a perfect landing, jump or trick. Barreling down a mountain on a small board has also taught us a sense of accomplishment that when we fall, we can get up again and keep going. Thank you for everything you have done for Blue Angles, and for all of your time and effort to provide this incredible experience for us. If it wasn’t for you, we would not have had this opportunity. Thank you for helping me to grow and mature into the person I am becoming. 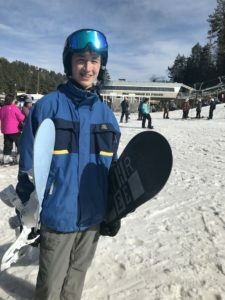 Our mission is to provide positive snow-riding experiences for youth that will enhance their personal and social growth. Blue Angel Snow fosters this development by emphasizing athletic development and independence in a supportive, fun and friend-filled environment.